Nate Thomas, head of the film production option in the California State University, Northridge Department of Cinema and Television Arts, was honored this month by the National Congress of Black Women Los Angeles Chapter (NCBW-LAC) with its “Good Brother’s Award” at the organization’s 9th Annual Luncheon. CTVA professor Nate Thomas was honored by the National Congress of Black Women Los Angeles Chapter (NCBW-LAC) with its “Good Brother’s Award” at the organization’s 9th Annual Luncheon. Photo courtesy of Nate Thomas. Thomas was one of nine people of color honored by the NCBW-LAC at the luncheon. 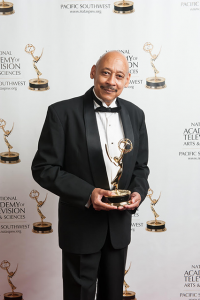 The nonprofit honored him for being the first African-American film production program head at a California State University, as well his career achievements in the industry and position as a respected faculty mentor to a sizable group of industry influencers who were his protégés. Along with Thomas, the NCBW-LAC honored Rep. Karen Bass, a congresswoman representing California’s 37th District; Tasha Cerda, the first African-American female mayor of Gardena; Judge Kevin Ross, host of the nationally syndicated TV court show Judge Ross; and several others. The event took place Aug. 18 at Juanita McDonald Carson Community Center in Carson. NCBW-LAC is a nonprofit dedicated to the educational, political and cultural development of African-American women and youth. From 2016-18, NCBW-LAC awarded 35 scholarships to college-bound students totaling $19,600. The LA chapter is a member of the National Congress of Black Women, an organization founded in 1984 by the late Hon. Shirley Chisholm. For more information, visit www.nationalcongressbw.org or www.ncbwinclac.org.